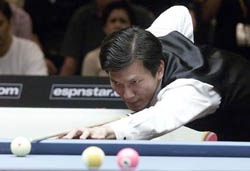 The US contingent at the 2005 International Challenge of Champions was cut in half this evening as Corey Deuel lost 5-2 and 5-3 to two time Challenge of Champions winner Fong-Pang Chao. Chao will face Niels Feijen in the second round on Thursday, while defending US Open Champion Gabe Owen will wait on the final match today to learn his opponent for tomorrow. The final match today will see defending champion Thomas Engert facing 'The Magician' Efren Reyes. The Challenge of Champions is sponsored by Olhausen Billiards and Viking Cues. For the duration of the Challenge of Champions, get 25% off all Viking cues in our online marketplace.